It's important to ground your house. But you? Not so much. I'm amazed at the lengths that some people will go to in order to make a dishonest buck. I mean, wouldn't it be easier just to start a legitimate business than to spend years trying to scam people out of their hard earned money for things like cold fusion generators, cell phone radiation shields, and homeopathic nonsense? And yet, here's another scam you should know of, and avoid. Technically speaking , grounding (which is also known as earthing) is a real thing. 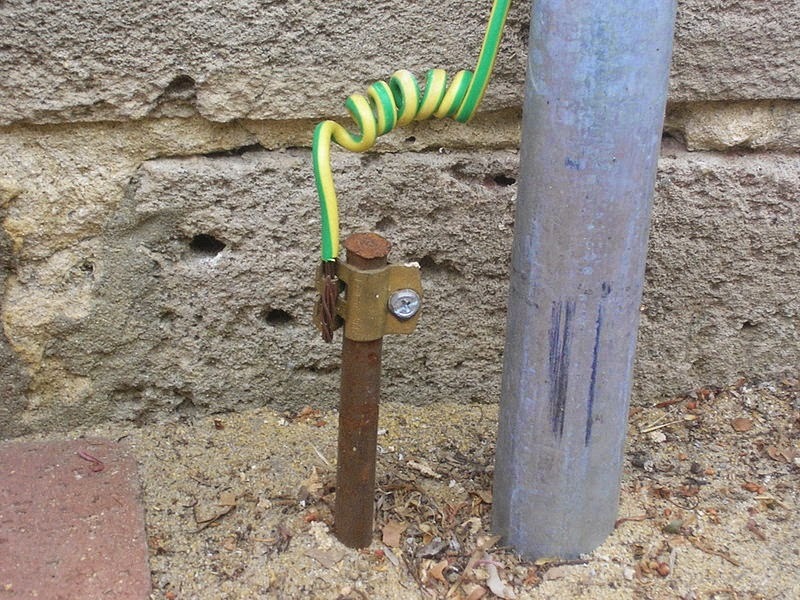 Your house is electrically grounded by conductive pipes and wires sunk into the soil. The conductors provide a path for electrons to flow between the electronics in your home and the earth. This is important because without it many electronic devices would malfunction, or you could get a serious shock when turning on or off lights and appliances. There are, however, no medical benefits to grounding your body, despite the assertions of a new wave of shysters. A new giant cosmic ray detector could be the most massive planet in our Solar System. Three scientists at the University of St. Andrews in the UK suggest that Jupiter, with its thick atmosphere and colossal size, could be the ideal place for hunting the highest energy cosmic rays, yet. Cosmic rays are high-energy particles that are thought to originate from objects outside of our Solar System. Because they consist mainly of high-energy protons and atomic nuclei, scientists think that some of the highest-energy sources in the universe could produce such rays. Supernovae and active galactic nuclei are two possible origins. 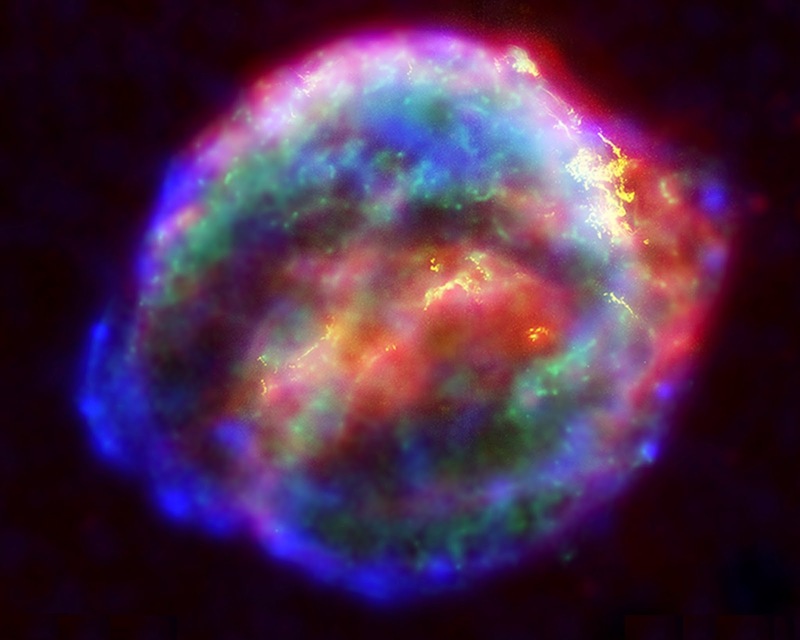 X-ray, Optical and Infrared composite of Kepler's Supernova Remnant. So far, the highest-energy cosmic rays that scientists have observed reach about 1020 electron volts. That’s 40 million times the energy that accelerated particles in the Large Hadron Collider attain. 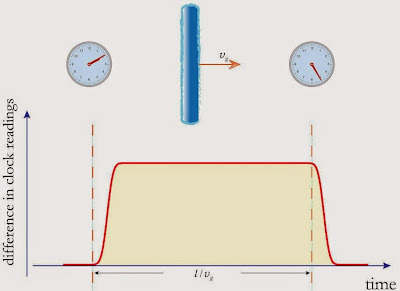 Particles with this kind of energy will destroy living tissue and wreak havoc on microelectronics. Thankfully, these high-energy cosmic rays are incredibly rare and the highest energy rays, which can do the most damage, are the rarest. The more rare the particle, the larger surface area scientists need in order to better their chances of observing a single signature, which brings us to Paul Rimmer, a research fellow at the University of St. Andrews who led the study. The N.S. 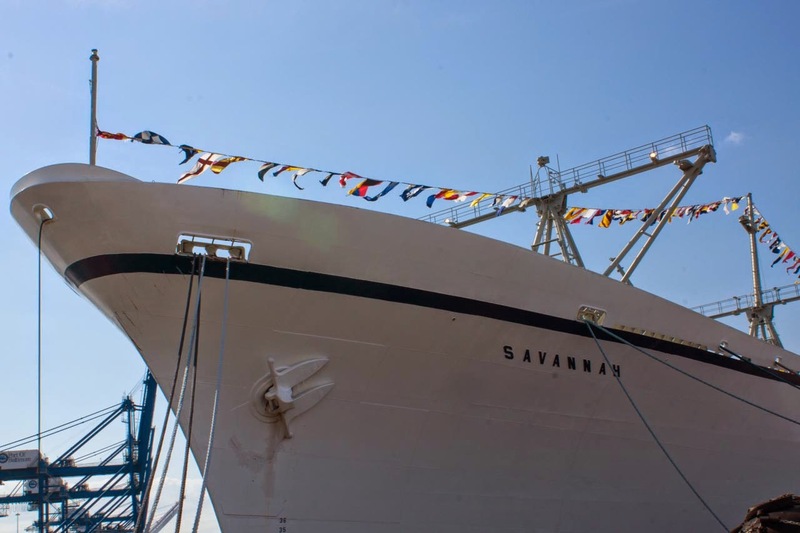 Savannah is the only nuclear powered civilian ship the United States built. Born out of Eisenhower's Atoms for Peace program in the 1950s, its builders hoped it to be the harbinger of the nuclear powered future. Instead, it's now mostly idle, an artifact of another era. Today, the N.S. Savannah is docked in Baltimore Harbor. Walking up to it, there's no immediate indication that it's powered by an atomic reactor at its heart. Summer vacation is just around the corner. If you’re planning a trip to the nation’s capital, there is a new exhibit at the Smithsonian’s National Air and Space Museum on the Mall worth checking out. National Air and Space Museum in Washington D.C. Shortly after NASA launched the Hubble Space Telescope on April 24, 1990, scientists realized something was wrong. The long-awaited instrument that scientists anticipated would usher in a new era in astronomy was sending them fuzzy images. The problem was the mirror – the eye of the telescope. The blunder was a major blow to scientists, but that’s just the beginning of the story. Three years later, in 1993, during the first of four Hubble servicing mission, NASA astronauts repaired the telescope’s vision by attaching two instruments. 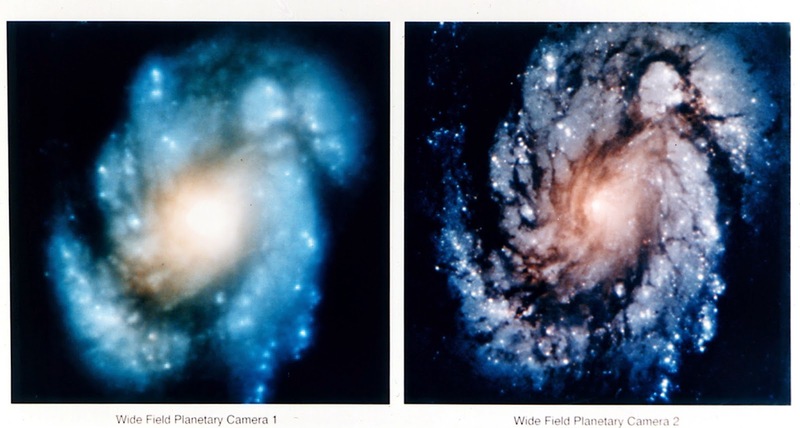 These two corrective instruments are why, using Hubble, scientists have been able to set a new eye on our universe, the likes of which had never been set before. The resulting images and knowledge Hubble brought to the table, exposing us to the breathtaking beauty and utter vastness beyond our Solar System, speak for themselves. McCarty Glacier, Alaska. Left: July 30, 1909. Right: August 11, 2004. 1909 picture taken by Ulysses Sherman Grant. 2004 picture taken by Bruce F. Molnia. Glacier Photograph Collection, National Snow and Ice Data Center/World Data Center for Glaciology. This week on the podcast I'm talking with physicist Paul Halpern about Einstein's theory of distant parallelism. Never heard of it? It was on the front page of the New York Times in 1929. Einstein himself said it was more important than general relativity. The head of the NYU physics department predicted that it might give us antigravity devices. So what happened? It turns out the theory was doomed from the beginning. Wolfgang Pauli finally convinced Einstein to let go of distant parallelism, but it wasn't the last time Einstein had bet his hand on a theory that didn't pan out. Check out the podcast to hear more. They say that to see is to believe. Nowhere is that more true than for astronomers who, despite their ongoing attempts to understand what dark matter is, have witnessed countless examples of the elusive stuff in action. What astronomers have observed so far is that the only way in which dark matter reveals itself is through its gravitational influence on visible matter. Therefore, to better understand dark matter, astronomers are in the process of mapping where in our universe it disrupts the visible matter around it. Considering that dark matter accounts for about 26 percent of the mass in our universe, there are quite a few locations where it leaves its gravitational mark – too many for an individual to count. Computers can make quick work of large data sets, but some of the tracking software for spotting evidence of dark matter is not as efficient as astronomers might like and by no means is ready for the deluge of data that will come from telescopes like the Large Synoptic Survey Telescope. In an attempt to solve this problem, astronomer David Harvey approached a company called Kaggle. Kaggle deals in data mining and crowdsourcing. It establishes competitions, daring data scientists across the globe to design improved software programs than what companies like Allstate, Ford, Facebook, GE and NASA currently use to analyze certain data sets. Without visual contact of the ball, a player is more likely to let his team down and miss the catch. But up until recently, no study had been able to prove this was the case in a real, ball-catching scenario. Eye-tracking rig confirms that players must watch the ball to catch it. For the first time, scientists have documented the eye movement of athletes running at full speed to catch fly balls. The results are the most convincing yet to support past notions that constant eye contact is essential to a successful catch. In the past, scientists have attempted to study the eye movement of athletes by observing their gaze as they ran, or tracking their eye movements as they caught virtual balls in a confined, enclosed space. None of these studies, however, could say with absolute certainty that the catchers were always watching the ball. Scientists have seen lion, tigers, bears and some of nature's most ferocious creatures hunt and devour their prey. But a black hole eating a snack? That is something much more rare, which makes 2014 an extra special year in black hole science. A massive, gaseous object called G2 is making a close pass around Sagittarius A*, the supermassive black hole at the center of the Milky Way galaxy. Astronomers think some of the gas from G2 will fall onto Sagittarius A*, and give them a front-row seat to a black hole feeding. Listen to this week's podcast to hear some of many things astronomers hope to learn when the falling matter from G2 meets its dark fate. Little did the aspiring medical student, Max Talmey, know at the time that his weekly lunches with the Einstein family in the late 1800s would cultivate a lasting relationship with Albert Einstein. “I remember Uncle Max faintly as a rather austere gentlemen wearing a jacket and vest, who did not interact with me,” said Debbie Ehrenstein who described what her seven-year-old self remembers of her great uncle. Debbie Ehrenstein is mother to David Ehrenstein, the Focus editor for the APS online publication Physics. Talmey was born in Poland in 1869 and died in New York in 1941. More than his medical contributions or his interest in international languages, Talmey is most noted for his relationship with Albert Einstein, which began during his time as a medical student in Germany. Every Thursday afternoon, Talmey would take a break from his studies and make his way to the house of the Einstein family. There, in 1889, he met Albert Einstein for the first time. 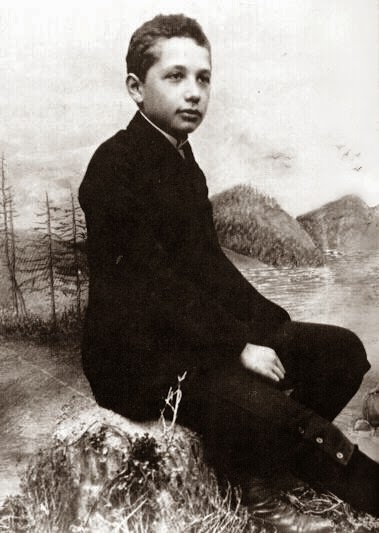 Albert Einstein as a child taken in 1893. Image courtesy of Wikipedia. Every year, the Physics Central crew, our friends and colleagues, and thousands of students descend on Six Flags America for a day of physics thrills. 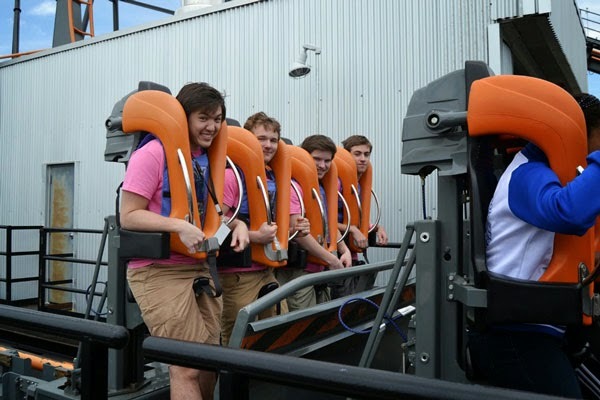 During the most recent Six Flags Physics Day on May 2, we gave out accelerometers to attending students so that they could measure the g-forces they felt on the park's various coasters. When students were done measuring their g-forces, we compiled their data and printed out charts of their altitude and acceleration throughout the ride. As our data show, the rides at Six Flags America live up to their threatening names such as "Apocalypse" and "Tower of Doom." We measured accelerations upwards of three to four g's on some curves — that's three to four times the acceleration felt due to Earth's gravitational pull at the surface. On some of the rides' steep drops, however, our riders felt almost zero g's as they approached free fall. But even if you didn't come to Six Flags Physics Day, you can still participate in the fun. 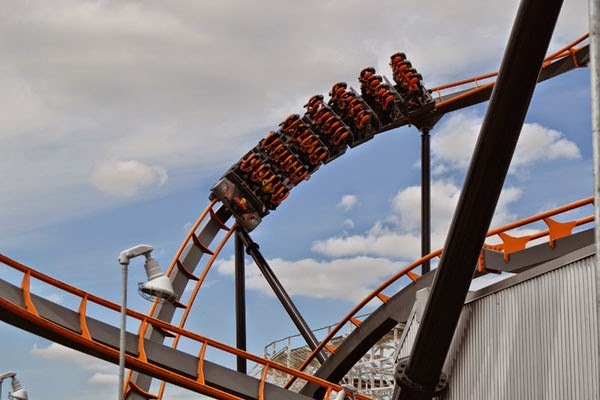 We've compiled front-seat videos for all of the rides we measured at Six Flags America (courtesy of CoasterForce) along with acceleration data for each one. 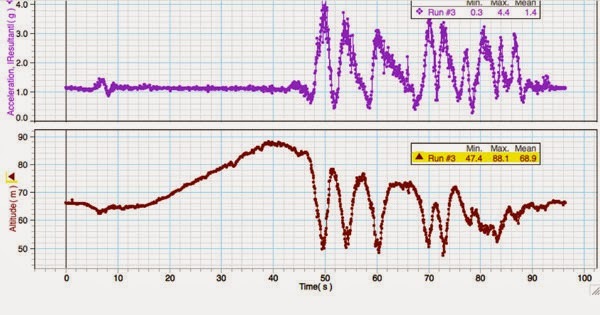 With videos and data in hand, it's time to test your knowledge of roller coaster physics. For today's quiz, see if you can match the rides with their acceleration data. Are you up to the challenge? Hold onto your chair, and enjoy the ride. The Superman ride is built for speed with some of the steepest drops in the whole park. While there's not as many twists and turns as the other rides, Superman more than makes up for it with near-free-fall moments during its quick descents. 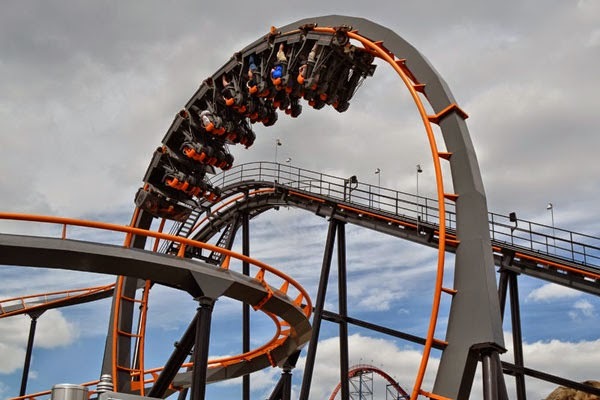 Apocalypse features a slew of twists, turns, and drops as it snakes around itself for a thoroughly heart-pulsing ride. In a recent debate over the question of life after death that was part of the Intelligence^2 series, a neurosurgeon and a medical doctor argued in support of the proposition "death is not final", while a neurologist and physicist argued against the proposition. As physicist Sean Carroll points out in arguing that death is final, life is a process and not a thing, in the same way that fire is a process. When you blow out a candle, the flame doesn't go anywhere, the burning process simply stops. Your conscience is a process going on in your brain. When it stops, it too doesn't go anywhere, it just stops. Combine a firestorm with some tumbleweeds and a dust devil and you get a massive vortex that’s unlike anything you’ve seen before. Watch as fire experts in Rocky Mountain, Arkansas come face-to-face with a smoky, debris-littered dust devil moving across a burning field. Dust devils are not nearly as powerful or destructive as tornados, but that does not stop the cautious men in the video from keeping their distance. Dust devils form when hot air near the ground finds a section of low-pressure cool air above it. When this happens, the hot air quickly rises and under certain conditions it can start to rotate, forming a vertical column. Usually, the air near the surface heats up due to radiation from the Sun. But it looks like what happened in this scenario is that the heat from the controlled fire initiated the vortex. And as the dust devil grew, it began collecting nearby tumbleweeds in the process – the large, black, floating clumps. An international collaboration of scientists has created element 117 in a laboratory at the GSI Helmholtz Center for Heavy Ion Research in Darmstadt, Germany. Element 117—temporarily referred to as ununseptium—was first created in 2010. The new work confirms that those earlier results are repeatable using a different instrument. Element 117 is the second heaviest element ever created, landing just behind 118. It offers nuclear physicists an extreme example of how atomic nuclei behave, and thus a way to put their theories for lighter nuclei to the test. In addition, scientists are interested in seeing just how many protons and neutrons can be packed into an atomic nucleus. Is there an end to the periodic table? But perhaps the most exciting prospect is how this research brings scientists closer to finding "the island of stability." While most super heavy nuclei are large and unwieldy, and tend to break apart in less than a second. But theory suggests there may be combinations of protons and neutrons that are structurally stable, giving the nuclei unusually long lifetimes. Besides creating element 117, the researchers also created a new isotope of element 103, Lawrencium, which stuck around for nearly 11 hours before decaying. This is leaps ahead of 117 (which has a half-life of 78 milliseconds), and most superheavy elements, which decay away in less than a second. Listen to the podcast to hear what some of the scientists involved with this research have to say about the new work. Every minute of every day, over a dozen dark matter detectors across the globe lie patiently in wait -- their bellies filled with ultra-pure liquid that is hungry for a dark matter particle. Dark matter particles should, in theory, interact with the liquid inside of these detectors, leaving behind a unique signature. 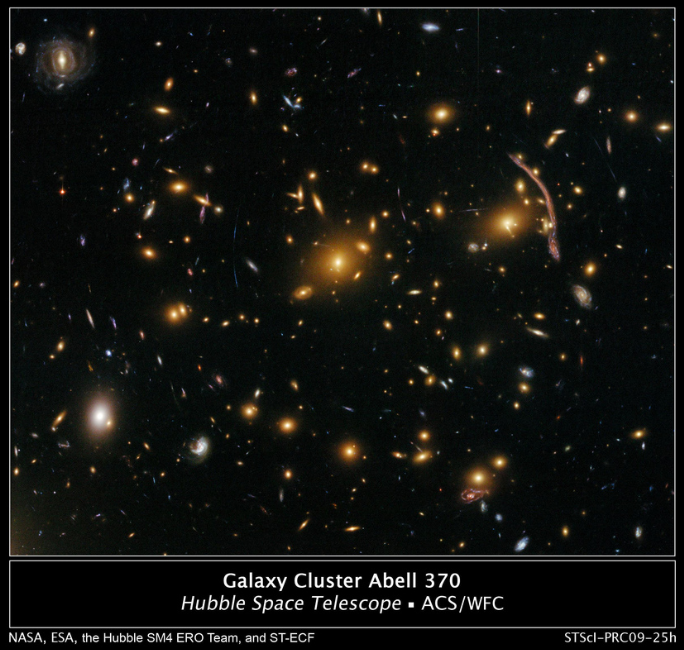 But what if dark matter is not comprised of particles? A pair of theorists is considering the possibility. In particular, they are looking at a type of defect in space that might have been the result of cooling in the early universe and could be the dark matter for which everyone is searching. 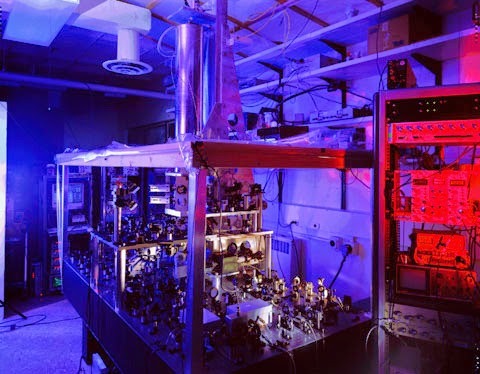 Atomic clocks, the theorists argue, could be just the instrument to detect these defects. A network of atomic clocks, such as those aboard GPS satellites, could offer the next step in understanding this elusive material that makes up over a quarter, 26.8 percent, of the mass-energy of our universe. When the universe was in its infancy, it was unimaginably hot, but as it expanded the universe underwent a cooling period. This cooling led to what some scientists think of as cracks, or topological defects, in space; one example being cosmic strings. General consensus surrounding dark matter is that it is a form of particulate matter. The structures of objects in our universe behave as if they contain more mass than what scientists can account for from observations. This invisible mass was given the name dark matter. But perhaps there is another explanation. A second theory is that dark matter is not a particle at all but a series of topological defects – cracks throughout space that lead to these bizarre observations of missing mass that scientists do not fully understand. If this were the case, then dark matter detector experiments, like those at the Gran Sasso Laboratory in Italy and the Deep Underground Science and Engineering Laboratory in South Dakota, do not have the right technology to detect dark matter. However, atomic clocks could. I'm a huge fan of Elon Musk, and we're proud to have featured an interview with him here on the Buzz. So, that's one way to have a chat with the closest thing the real world has to Iron Man. Here's another way . . . It's icky (that's the only printable adjective I can think of), but maybe it will reach people who would never read our interviews. When you’re talking with people at a noisy restaurant, it’s usually not too hard pick out your friend’s voice over the din. Humans, and really all mammals, have this talent to isolate and focus on certain sounds while suppressing others. It’s a complicated feat that happens mostly in the ear. Now, scientists at the Institute for Neuroinformatics developed a mathematical model to use computers to reproduce this ability. In order to hear your friend talking, sound waves enter your ear canal and transfer to the cochlea. Inside, the sound waves wiggle thousands of tiny hair cells, sending electrical impulses to the brain. But they don't just pass along data — they're also able to enhance weak signals that need amplifying. Sound waves come in the ear canal, vibrate the tympanic membrane, and are then transferred into the cochlea. Thousands of hair cells inside the cochlea then transmit electrical pulses to the brain. Image Credit: Inductiveload. To mimic our ear's ability to isolate sound in a noisy room, the researchers attempted to isolate a single pitch among many different frequencies. They used a “Hopf bifurcation model” to focus on the point where there is a change in the stability of the system at one given point. The model allowed for them to accurately portray compression rates and a more effective isolation of low-intensity sounds. Other models have focused on the specific point of divergence, but for this experiment, they focused their model away from the bifurcation point. 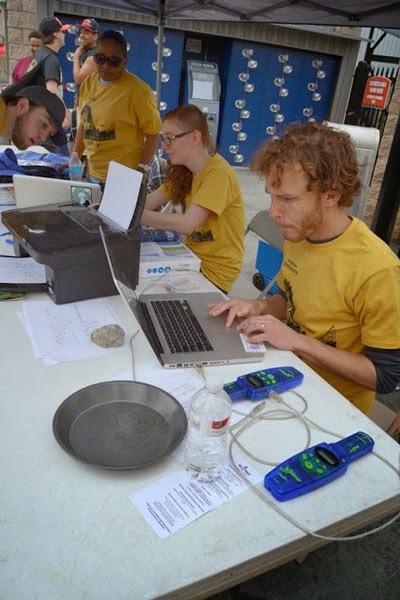 Not only were they able to identify the pitch, but their model was also able to successfully suppress the frequencies they didn’t want to hear. (ISNS) -- Spacetime is a somewhat slippery concept -- Einstein described the universe in four dimensions, combining the well-known three dimensions of space with time. Physicists now suggest that spacetime may itself be a fluid, a very slippery type known as a superfluid. These new findings could help scientists in their quest for a theory of everything that explains how the cosmos works in its entirety. Crack In Space Time by CS Ostini (cropped from original). Image Credit: vegas_buff via flickr | http://bit.ly/1n2VPkc. Scientists have long sought to develop a theory that can describe every aspect of how the universe operates. Currently, researchers have two disparate theories: quantum mechanics and general relativity. Respectively, these two theories can mostly explain the cosmos on its tiniest scales and its largest scales. Quantum mechanics can explain the behavior of all the known particles, while general relativity describes the nature of spacetime and gravity. 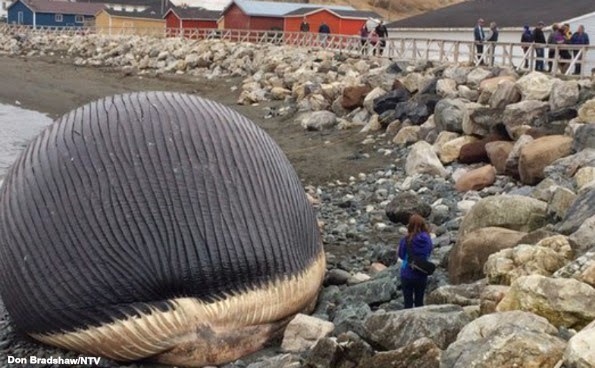 There's been lots of coverage of a trio of dead blue whales near the town of Trout River in Newfoundland. As the whales decay, they're expanding more and more as their internal cavities fill with noxious gases. As disgusting as that is, it's not particularly dangerous. The real threat could come from the gases inside the decaying animals. Much of the volume of the bloated whales is likely taken up by methane, which is quite flammable, and potentially explosive. We at Physics Buzz (well I and the Mathlete anyway) were wondering what might result if the whale were to explode rather than just pop. Based on our calculations, that lady in the picture above is in much more danger than she realizes. In fact, it might make sense for the local authorities to consider evacuating some of the nearby buildings, or at least posting a no smoking sign or two. Check out our calculations below to see just how big a boom we think the whale might make if the worst were to happen (hint - it's really, really big).